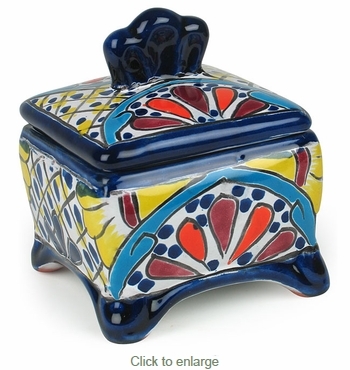 This Talavera jewelry box with lid is perfect for jewelry but you can use it for so much more. Cotton balls, cotton swabs gauze pads will find a home in this colorful box. All of our Mexican Talavera accessories are handmade and hand painted by Mexico's talented potters. Direct From Mexico will carefully pack your order to ensure it arrives to you safely.